These prices cover virtually all seat configurations. Please read the price list before sending an email asking for a quote. 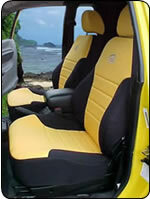 Black is the trim color for all seat covers. (Factory Tailored seat cover) - These seat covers fit all types of front, middle and rear bucket seats in cars, vans and trucks. These are generally 3 piece seat covers, specifically tailored for that particular bucket seat in your vehicle and constructed completely of neoprene. Colors consist of any insert color from our 33 color selection with BLACK as the trim color. (Factory Tailored seat cover) - These seat covers fit all types of front, middle and rear bench seats in cars, vans and trucks. These are generally 2-6 piece seat covers, specifically tailored for that particular bench seat in your vehicle and constructed completely of neoprene. Colors consist of any insert color from our 33 color selection with BLACK as the trim color. (Factory Tailored seat cover) - These seat covers fit all types of front, middle and rear split bench seats in cars, vans and trucks. These are generally 3-10 piece seat covers, specifically tailored for that particular split bench in your vehicle and constructed completely of neoprene. Colors consist of any insert color from our 33 color selection with BLACK as the trim color. Split bench Seats (Factory Tailored seat cover) - These seat covers fit the 40/20/40 split bench seats in some of the new full size and mid-size trucks. These are generally 6 piece seat covers, specifically tailored for that particular split bench in your vehicle and constructed completely of neoprene. Colors consist of any insert color from our 33 color selection with BLACK as the trim color. 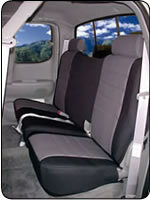 (Factory Tailored seat cover) - These seat covers fit all types of rear fold & tumble bench seats, and jump seats in trucks. These are generally a 2 piece seat cover, specifically tailored for that particular bench seat or jump seats in your truck and constructed completely of neoprene. Colors consist of any insert color from our 33 color selection with BLACK as the trim color. Euro style half piping seat covers are made with black as the outside color, any solid color inside with piping to match the inside color. 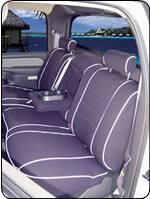 This is not a seat cover, it is an option (color choice) for seat covers. 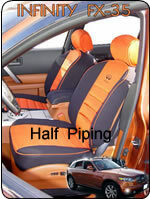 Order seat covers and use the half piping option if you want half piping and one of our 24 solid colors available. The outside panel color for this option will be black. Half Piping outside panels trimmed, add $40.00 per set. Seats made with full piping are available in these SIX SOLID DOUBLE SIDED COLORS with piping trim in any of our 24 solid colors. 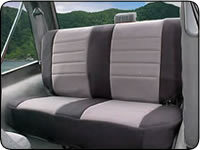 This is not a seat cover, it is an option (color choice) for seat covers. 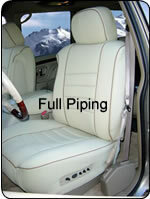 Order seat covers and use the full piping option if you want full piping and one of our six solid colors available. All panels trimmed, add $50.00 per set. 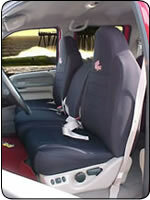 All Seat Covers are made from the YEAR, MAKE, MODEL, and SERIES of your particular Vehicle. Please take a real good look at your seats before ordering. All prices above do not include shipping charges. Wet Okole Hawaii accepts Visa, M/C, Disc. and Money Orders; NO CODs. All After Market Seats and un-identifiable seats require an actual picture of the seat to be seen by a technician prior to ordering. Please feel free to call and talk to anyone of our Customer Service Representatives.